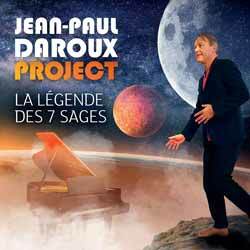 Pianist and composer Jean-Paul Daroux releases his latest album, via Plaza Mayor Company Ltd. La Légende des 7 Sages is a melodic, chilled out jazz album that branches out to encompass pop, lounge, easy listening and classical. It's an engaging and rich album which contains 9 tracks (51 min, 14 sec). This is an LP to relax and unwind to; to let your mind unravel and take in Daroux's unique take on the world. Being a pianist, it's probably not going to be a surprise to learn that Daroux's compositions mainly revolve around his chosen instrument. His playing is fluid and engaging and the entire release is comforting and welcoming. I have to admit that I did find one stand out track, that really stuck with me. 'La Ronde des Hélicos - Part 2' is an infectious, toe tapping piece with a beautifully memorable central theme. It's worth taking a step into Daroux's world.